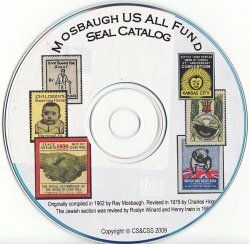 Mosbaugh's U.S. All Funds Charity Seal Catalog, Sections. 1 to 11, 1984 ed., on CD. All thirteen (13) sections of the All Funds Seal Catalog: Sec 1, U.S. Patriotic & Veteran Seals; Sec. 2, U.S. Fraternal & Civic Seals; Sec. 3, U.S. Catholic Charity Seals; Sec. 4, U.S. Lutheran Charity Seals; Sec. 5, U.S. Jewish Charity Seals; Sec. 6, U.S. Religious & Philosophical Seals; Sec. 6A, American Bible Charity Seals; Sec. 7, U.S. Ethnic Charity Seals; Sec. 8, Pets, Plants, & Wildlife Seals; Sec. 9, U.S. Medical Charity Seals; Sec. 9A, U.S. Easter Seals, Classic; Sec.10, U.S. Miscellaneous Charity Seals; and Sec. 11, Index. Published by the Christmas Seal and Charity Stamp Society (CS&CSS). 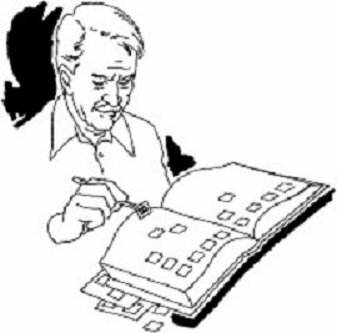 Catalogs are in pdf format, all images are b/w, copy quality, 2009 ed. Requirements: MS Word 2003 or higher and inkjet printer.